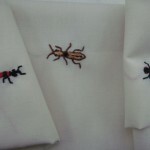 Bugs from Mary Gregs Nature Diaries embroidered onto material. One aspect of this project that I hadn’t foreseen was how it has encouraged me into other areas of work. After going to see Mary Greg’s nature diaries in the Graves Museum, Sheffield, I have started a “train” project (I have a 50 minute train journey to Manchester and back). Mary had painted a series of insects and animals (awaiting permission to add photos from her actual book). I thought it would be a tribute to her to try and sew her drawings…not being a great embroiderer it is proving harder than I thought. It will be an ongoing project , not sure what I will do with them yet either. When I looked at Mary’s Nature Diary I was very taken by her interest in animals and plants, she had included a rubbing from a fence post of the tracks in the wood left by a wood beetle, she had a fascination with the small and everyday things and a real pleasure in recording them. We had a fantastically productive day at Sheffield. The nature diaries are fabulous, not only revealing Mary’s accomplished drawing skills but also a keen eye for detail and a diligence and commitment to collecting that is abundantly evident through her Bygones collection (I wish I could post some images but we still need to receive copyright permission). Here she is collecting information about the flora and fauna of the Westmill area in Hertfordshire, but particularly in and around the garden at Coles, the family residence. Dating from the early 1900’s every page is a delight with a number of comprehensive drawings in a variety of media (she was very good at bugs and spiders) and handwritten notes which are both analytically incisive and heart felt. 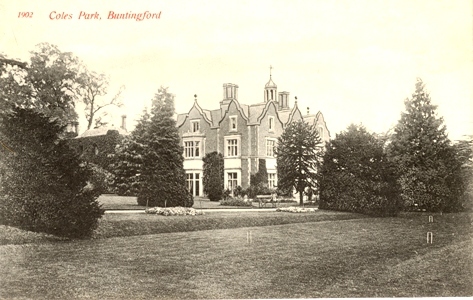 Writing of these books to the Guild of St George (to whom she donated the note books in 1940) she says “..I have two nature note books done at various times… They are…amateurish, I had no lessons. I tried to paint little things which I thought of interest or beauty – this Ruskin had taught me to aim at.…”. The drawings are very much in the Ruskin tradition. One of my favourite inclusions is a series of rubbings taken from a rough pole across a stile at Church Stretton. These show the galleries produced by the female beetles and larvae of scolytid beetles and demonstrate her attention to detail and genuine curiosity for the world around her. The books are also full of little anecdotes such as the mole that Hazel mentions “…found in the potting shed. Sorry to say (I/we?) killed it fearing its ravages in the garden“. But she drew it afterwards so all not lost then! She sometimes tried to save things too, like the baby chaffinch that fell out of the nest whilst she was taking tea, she gave it a meal of chopped egg! Perhaps the notebooks also reveal the origin of one of the objects in the Bygones collection! In November 1917 she wrote “… I’ve found a group of the smallest funghi I have ever seen. I looked at a piece of this plank and looked at them through a microscope…”. There is a microscope in one of the cupboards at Queen’s Park. I wonder if it was the one she used? Also stuck into one of the books is a wonderful photograph showing “the artist at work“. Mary is sat at a table full of drawing equipment in the garden at Coles (if only the microscope had been there!). Mary Greg is leading us to many places. Sharon and I joined Alex in Sheffield last Wednesday to visit the Graves Art Gallery and see Mary’s Nature Diarys. (Awaiting permission to add photos). She had painted some wonderful bugs and made very detailed notes of the weather and animals. Lovely stories of finding moles in the potting shed. Alex has also arranged for us to go to the Archive where another bundle of Mary’s letters were waiting for us to see.